An Early Christian basilica with stunning floor mosaics, also known as the Great Basilica or Bishop’s Basilica, located in the southern Bulgarian city of Plovdiv will be excavated in a long anticipated project funded by the America for Bulgaria Foundation, after a deal between Bulgaria’s Ministry of Culture and Plovdiv Municipality. The upcoming excavation of the 5th century AD Bishop’s Basilica, which was discovered in 1982 by archaeologist Elena Kisyakova, has been announced after a meeting between Bulgaria’s Deputy Culture Minister in charge of archaeology, Boni Petrunova, Plovdiv Mayor Ivan Totev, and representatives of the America for Bulgaria Foundation, a U.S.-Bulgarian NGO, local news site Plovdiv24 reports. 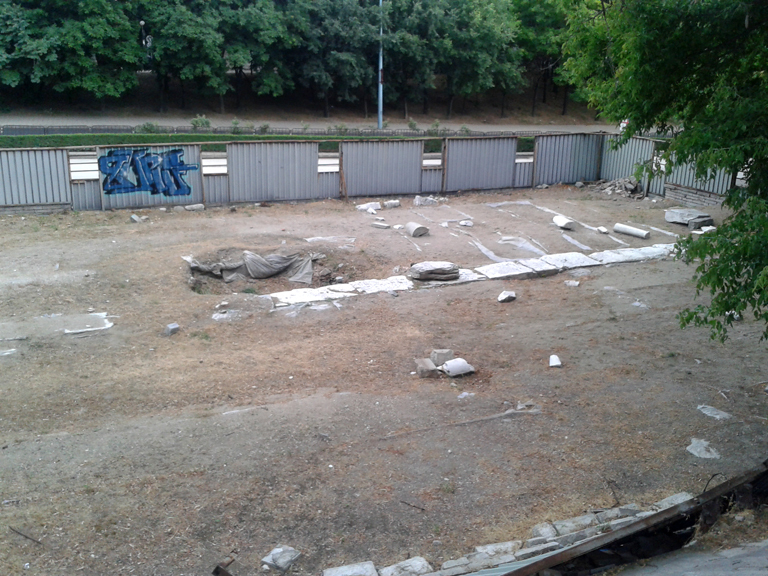 As the remains of the Great Basilica of ancient Philipopolis, as Plovdiv was known in Roman times, are located on two properties owned separately by the central government and the local municipal authorities, the participants in the meeting have shaken hands on a tripartite agreement outlining their respective responsibilities for the major archaeology project. The America for Bulgaria Foundation is going to fund the excavations of the Early Christian monument with a grant of BGN 4.9 million (app. EUR 2.5 million). In addition to the digs, its grant is going to finance the construction of a two-storey cover over the ancient site as well as a presentation center and a museum where floor mosaics will be exhibited on an area of 1200 square meters. The project for the excavation and restoration of the Great Basilica of ancient Philipopolis with funding from the America for Bulgaria Foundation was first presented in September 2014. It is expected to be completed in June 2017. Plovdiv Municipality is going to contribute funding for the rehabilitation of the area around the Great Basilica, while Bulgaria’s central government is going to grant the municipal authorities management rights over the respective property. Plovdiv Mayor Ivan Totev has made it clear that the authorities are expecting an excavation permit from the Plovdiv Regional Museum of Archaeology, and that the digs will be started within weeks. Plovdiv’s Great Basilica, which is sometimes likened to similar historical monuments from ancient Constantinople and Ravenna, the last capital of the Western Roman Empire, will be excavated once again by a team led by archaeologist Elena Kisyakova who discovered it in 1982. This is the second project of this kind, after in 2010-2014 Bulgaria Culture Ministry, Plovdiv Municipality, and the America for Bulgaria Foundation collaborated for the excavation and restoration of another Early Christian monument, the so called Small Basilica dating back to the 5th century AD. The project was financed by the America for Bulgaria Foundation with a BGN 1 million (app. EUR 511,000) grant, and was formally opened for tourists in May 2014. The Early Christian Great Basilica (or Bishop’s Basilica) is located in the center of the ancient city of Philipopolis, which is itself in the downtown of today’s Plovdiv in Southern Bulgaria. It was discovered in 1982 by a team of archaeologists led by Elena Kisyakova. The excavated remains of the Great Basilica were fenced off as part of conservation efforts but have not been excavated further ever since. Back in 2002, Plovdiv Municipality sold the property to a private firm even though it contained a formally recognized monument of culture. As a result, once the scandalous deal unraveled, it took the municipality and the central government seven years of court trials to regain the ownership of the Great Basilica site. The Philipopolis Bishop’s Basilica is impressive in size – its length totals 86.3 meters (the combined length of its naos with the apse is 56.5 meters), and its width is estimated to be 38.5 meters. The entire floor of the three-nave basilica is paved with unique Early Christian mosaics covering a total area of 700 square meters. The mosaic floors were created in two construction stages. The color mosaics feature primarily geometric motifs and images of birds typical of the second quarter of the 5th century. About 70 different species of birds have been identified, some of which appear to be unknown to contemporary ornithology. Based on the mosaics, the Early Christian Bishop’s Basilica in the ancient city of Philipopolis is dated back to the first half of the 5th century BC, the Late Roman – Early Byzantine period. It was destroyed in the middle of the 6th century, possibly during a barbarian invasions. It was built on the foundations of an earlier building of similar size and potentially with similar functions.